Earn $11.13 in Rewards credit (1113 points) What's This? The Schwalbe Pro One HT Tubular Tire might just be the holy grail of tubulars. Handmade by Schwalbe with their top materials and technologies, the Pro One HT is the first choice of professionals. OneStar Triple compound and a carcass mixture made from Polyester and cotton provide a low rolling resistance and high pinch flat protection. The diamond tread indicates grip even in difficult conditions. 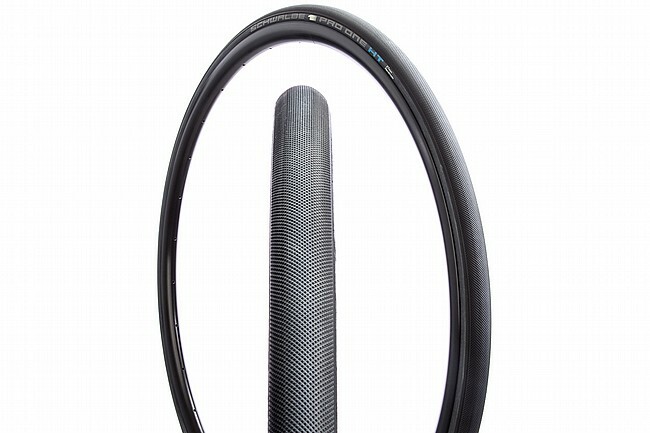 The Schwalbe Pro One HT Tubular Tire is entirely handmade. Tubular tires require tubular-specific rims. Handmade tubular casing made in new Schwalbe facility. Diamond tread pattern for all-condition grip. Level 5 V-Guard puncture protection.